Any wine lover knows that once you begin to drink better wines, it is virtually impossible to return to the grocery store brands you knew and loved in your earlier wine drinking days. Sure, you have one label here or there that you keep on reserve to take to those not-so-important dinner parties, but for the most part, wine shopping at the grocery store is limited to last-minute emergencies, and gifts for friends who don’t have a clue what they are drinking anyway. Once you have graduated to the “over $20 bottle” range, it is hard to return to cheaper wines; no matter how enticing the low price point is. Typically, more expensive wine is more expensive for a reason…it just is better. So what makes some wines cheap and others more expensive? Why is it that you can go to a major chain grocery store and pick up a bottle of California Cabernet for $7.99, when there are much more expensive bottles out there at fine wine shops? Who cares, right? What if I told you that many winemakers, especially in the U.S. and Australia, attempt to “enhance” their lower price point wines with an additive called “Mega Purple”? Would you still be interested in drinking that wine? Well, it’s true. Many wineries use an extract made from grapes of Rubired, which is a hybrid variety developed by Dr. Harold Olmo of UC Davis, to buff up any deficiencies in their cheaper wines. Perhaps a particular batch of wine is lacking in color, or the flavors are slightly off, the Mega Purple is added to the wine to darken colors, or add a sweeter flavor in order to mask any signs of faults such as Brettanomyces, which may add a touch of “barnyard” smell to the wine. The Rubired extract is deeply colored and very high in sugar. It even has a “foxy” aroma due to its origins in Vitis rupestris, which is a native American grape vine. Interesting to note, Rubired is now almost 5% of the total crush in California–as important as Pinot Noir & Syrah. 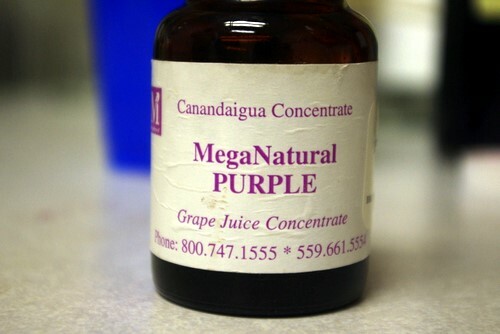 Mega Purple was introduced in 1992 by a subsidiary of the conglomerate Constellation Wines as a natural coloring agent. In 2007, Anil Shrikhande, VP of Research and Development at Constellation Wines, said that 20% of the annual production of the additive is sold to the wine industry. By adding Mega Purple to enhance their low end wines instead of using a more deeply colored grape varietal, winemakers may be saving money on production, but they are creating boring, homogeneous, “empty” wines for mass production. Just how many winemakers use this masking method is unknown, as much of the wine industry is hush-hush on its use. In the history of winemaking, Elderberries were once used to add color to wine, but were banned for that use by the nineteenth century. Should we be looking at Mega Purple this way? For another great article & more information on Mega Purple, click here. I would join the ban Mega Purple campaign. Thanks for the info, I’m going to be looking out for this.